A few years ago my very talented musician friend, Dave Tilton, surprised me when he announced he'd written a novella. I was surprised to learn that he'd been writing, and delighted with how good the book was. But novellas are notoriously difficult to publish. Dave's book took place in Manteca, California, and I had just finished, coincidentally, a novella that comes to an end in the neighboring town of Modesto. So, we put the two novellas together in this little volume, mashing up the titles. 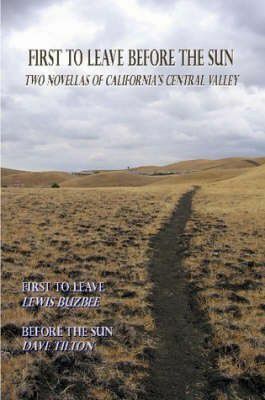 My novella, First to Leave, is an imagining of my grandfather's quest to bring his young family to California during the early years of the Dust Bowl. I like to think of it as a more intimate view of the Okie migration. Dave's Before the Sun is a coming-age-tale centered around baseball, god, and sugar beets. It is tender, hilarious, and a stark portrait of the great upheavals that shook so many families during the 1960s. Zachariah Taylor Macoby sat on his haunches on the edge of the cotton field and knew that the land had passed him by again, knew that it had never been his and never would be. He did not allow himself to think too long on the latter because that thought might stop him here on this dead land and keep him from moving, strand him. When he had brought his wife, two sons, and baby daughter to Oklahoma from Texas, he had done so because he had heard there was share land available and that you could work your way to buying it. In 1900, his father and mother had moved the family from Virginia to Texas on the same promise. Always the promise, the land would be yours. He scratched his name in the dirt with a broken hollow branch and gently blew on the dust until his name disappeared. He saw and knew and directed the irony of the gesture, and in that gesture and the knowing of it lay the certainty of the family moving again. He had stopped hoping and began to make fun of himself and his place in the world.